Welcome to the four hundred and seventy-second of my blog interviews with novelists, poets, short story authors, biographers, agents, publishers and more. Today’s is with non-fiction author and columnist Peggy Mullins. A list of interviewees (blogged and scheduled) can be found here. If you like what you read, please do go and investigate further. Morgen: Hello, Peggy. Please tell us something about yourself, where you’re based, and how you came to be a writer. Peggy: My name is Peggy Mullins and I live with my husband and a wonderful family of animals on a small farm in the foothills of the Shenandoah Mountains in Virginia. I am an avid horseback rider and have a deep love for horses and dogs. We have three horses and our dog Ika whom my new book Everybody Loves Ika: One Woman’s Memoir of Her Dog, an American Pit Bull Terrier is written about. I have always loved to write and was first published at the age of fifteen. I have had newspaper columns and written many articles for magazines. Everybody Loves Ika is my first book and is getting rave reviews even though it has been out only a few short weeks. Morgen: Congratulations, that’s fantastic. You write non-fiction, how do you decide what to write about? Peggy: I find true to life stories are everywhere around us and are so much more interesting than fiction. Often they are more unbelievable because they are true. This book is the true story of my dog Ika, how he was saved from a dog fighting facility and how he came into my life. It is also the true story of my own life and how it parallels Ika’s in many ways. It is a book about an abused childhood and the healing power a devoted animal can have in one’s life. I also write fiction and my next book Dinkyy the Donut Horse will be released within the year. Morgen: Oh, sweet. 🙂 What have you had published to-date? Peggy: I have had many newspaper columns the latest was with the Fauquier Times Democrat. I had a weekly human-interest column entitled Just Horsin Around. A selection of these articles will appear in my third book by the same name. I have written articles, both non-fiction and fiction for magazines also. In addition, I wrote and published a thesis in the American Psychological Association Publication. Morgen: You’re self-published, what lead to you going your own way? Peggy: I didn’t even try to submit my manuscript to a major house. Self-publication was easy and affordable. In addition, the process went quickly. I understand the major houses take up to three years from start to finish. Morgen: I’ve certainly heard a year or two but it can be frustrating however long. Are your books available as eBooks? Do you read eBooks or is it paper all the way? Peggy: My book is available on Kindle but I personally prefer paper with the author’s signature. Morgen: Margaret Attwood signs eBooks remotely (http://electricliterature.com/blog/2012/07/09/margaret-atwood-launches-fanado) but most authors I’ve spoken to say that they prefer paper (although most read both, I do). Presumably you had the say in your title / cover of your book? How important do you think they are? Peggy: The title of my book was my idea however, the cover and the sub title happened quite by accident. When I had Ika’s pictures (all 248 of them) done by a professional photographer, we dressed him up in many outfits. The one on the cover of him wearing an American flag bandana and his “All American Dog” hat fit beautifully with the subtitle: “One Woman’s Memoir of Her Dog, an American Pit Bull Terrier”. I think the title and cover of any book is the most important thing about a book. If the title of the book is boring or the cover unattractive no one will buy it. Morgen: That’s very true, although I bought James Patterson’s ‘The Quickie’ which I think is an awful title (but then it was co-written by Michael Letwidge whose collaboration ‘Step on a Crack’ was fantastic – I’ve still not read ‘The Quickie’ yet – so it was his name that drew me. What are you working on at the moment / next? Peggy: I am finishing the last few tweaks on my next book Dinkyy the Donut Horse and will send it off to my editor shortly. Morgen: Good luck. Do you manage to write every day? Do you ever suffer from writer’s block? Peggy: I do write every day but writer’s block really isn’t something I have had a problem with. Sometimes I get tired from sitting at the computer for hours but the ideas and words never stop. Morgen: Me too. Do you do a lot of editing or do you find that as time goes on your writing is more fully-formed? Peggy: My writing has definitely changed over the years. It also changes with the topic I’m writing about. If I am working on a serious piece that will have a different ring than a humorous one. If I am writing something technically correct that too will be different. A newspaper article will be more direct and to the point due to the limited amount of space I have to work in while a book will have a more descriptive flavour. I do a LOT of editing and rewriting. When I think it is the best I can do, I send it off to my editor and hope she doesn’t yell too much at me. Morgen: 🙂 Do you have to do much research? Peggy: This depends on what the topic is. However, even in a fictional work I often do a lot of research. For example, my next book, even though it is fictional, has a lot of information about horse breeds which took a lot of research. Morgen: It’s worth it though because there will always be an ‘expert’ out there. Do you have pieces of work that you think will never see light of day? Peggy: Oh yes, many. Sometimes I just write for descriptive purposes with no intention of incorporating them in anything. I have a lot of articles that are not good pieces and I will never submit them anywhere. Morgen: Oh dear. Have you had any rejections? If so, how do you deal with them? Peggy: Yes, I have had many rejections over the years but far less as time goes on. I think it is because I am more experienced at what I send out to a particular publication. I’ve learned not to send an article about alligators to a magazine whose focus is flowers. Live and learn! I am disappointed, of course, with rejections but that is just part of the industry. Morgen: It is, sadly, but I can see how a floral publication wouldn’t want reptiles. Do you have an agent? Do you think they’re vital to an author’s success? Peggy: Years ago I had an agent in the New York City area but she did not get any of my work published. She was just starting out and soon realized she would starve if she had to depend on her ability to sell. As far as an agent being vital to success they aren’t if they can’t sell your work. In addition, if the work isn’t very good an agent won’t be of any help. I don’t have an agent and I consider myself a success. Not a very rich one but I’m happy with what I’ve accomplished. Morgen: That’s the most important thing. How much marketing do you do? Peggy: I do a lot of marketing and since that is my background I have had great results. In just a few weeks I have four book signings set up (one of which has already happened), four shops are carrying my book and I have had to replenish several of them. Morgen: Wow, that’s fantastic. Maybe you could come back and do a guest blog for me on marketing – it’s usually the answer to the second part of my next question. What’s your favourite / least favourite aspect of your writing life? Peggy: I think my favourite aspect of writing is the freedom to be creative even in a non-fiction story. The least favourite is when I am not at my best and my writing suffers from it. Peggy: Don’t give up if this is your passion! Practice your writing skills and fine tune them continually. For example, I sometimes pick a subject and dissect it with my writing. Then I give it a closer look and work really hard at details. Next, I throw the whole thing out and start from a different angle on the same subject. It will amaze you just how creative your writing can be about something as simple as a twig. Morgen: Absolutely. I write a story a day and every Saturday is a one-word prompt. Is there a word, phrase or quote you like? Peggy: My favourite word is obstreperous. A close second is eclectic. Morgen: I love those. 🙂 Do you plot your stories or do you just get an idea and run with it? Peggy: I do both. Often I combine both techniques in one piece. I may start with an idea that just comes to me but eventually direction and focus must be applied to the things I write. Morgen: Do you have a method for creating your characters, their names and what do you think makes them believable? Peggy: Most of my characters are people / animals I know in real life. Even in my fictional work most of the characters are based in a real life person / animal I know. I look for, or make up, interesting names for them. Believability in a character, whether fiction or non, is how the author “sells” the character. I try to use reality in every character. For example, if I am writing about a particular type of animal I research the behaviours, characteristics, etc. of that type of creature so the character has a “reality” about it to the reader. Morgen: Again the research is all important. What do you do when you’re not writing? Peggy: I am an avid horseback rider and spend many hours a week riding/training my three horses. Morgen: How lovely. I rode a tiny (by comparison) horse called Bracken when I went on holiday to Devon in my pre-/early teens and loved it but haven’t really been on horses since, which is surprising (I guess) considering my mum (and her twin, my aunt) used to be a groom for racing driver Stirling Moss’ sister. I should have been horse-mad, but then I grew up with an older brother so am technology mad. 🙂 What do you think the future holds for a writer? Peggy: As long as there are people and communication there will be a need for writers. Morgen: I agree. Where can we find out about you and your writing? Peggy: Please go to my web site: www.peggymullinsauthor.com. 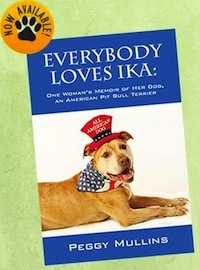 I am also on facebook, twitter and my blog: http://everybodylovesikadogbook.blogspot.com. Peggy: Morgen (with an e) I would like to thank you so much for inviting me to participate in your blog. I have enjoyed answering the questions. Morgen: I’m so glad and you’re so welcome. It really wouldn’t be what it without all my guests. Is there anything you’d like to ask me? Peggy: Where did you get the idea for this blog? It is wonderful and so helpful for writers. Morgen: Thank you very much. I’d heard it was a good idea and was inspired by another having met another blogger (philosopher Nigel Warburton) when I was volunteering at a literary festival in Oundle in March last year. I started mine a couple of weeks later and it took off from there. Thank you, Peggy. I put the new miniature horse, Dakota, next to Tauri’s field so they could acclimate. They lunged at each other. The fence held as they slammed into it to attack each other. Both did their best to get past the fence. Tauri was a large horse. Dakota was small. Both could do a lot of damage to the other. They battled all day. The next morning I took Ika to the barn. I wondered if the referee fence was standing. It was. When Dakota saw Ika, he tried to attack him. The referee, which Ika and I were on the other side of, held. Two weeks later, horse battles continued. Usually that’s plenty of time to acclimate horses. I didn’t let Ika get close to the mini because he could easily kill my dog. One day the mini was just staring at Ika. He didn’t offer to attack him. Ika was sitting on the other side of the referee looking back. I got busy in the barn and forgot about my dog. Horrified, I saw him in the middle of the mini’s field. The horse approached my dog. Ika just sat there. As the horse drew closer, he lowered his head. The mini was stalking the dog. What should I do? If I called Ika, his attention would be diverted. If I didn’t, the horse could kill him as I watched. I was frozen with indecision. Then my worst nightmare came true. The mini stomped his front feet. It was a warning. It shouted, Get out of my field! Ika was inches away from hooves that could end his life. He was wagging his tail. Exhausted, they walked over together to where I was standing by the fence. Ika was smiling. Peggy Mullins grew up in a hellish adoptive home with distant, abusive parents who found every opportunity to damp out the tiny glimmers of happiness Peggy managed to cling to in such a cold environment. Ika, a beautiful Pit Bull pup, was spared at the last moment from being born into a similar hell. Though his mother and many of his siblings didn’t make it out of their gruesome home alive, Ika survived thanks to the skilled and compassionate work of a quick-thinking vet and a few big-hearted volunteers. In time, Ika found his way to Peggy, who would give him a loving permanent home in which he would thrive. In return, Ika would teach Peggy the kindness, patience, and unconditional love that had long been absent from her life. Along with the surprising affection of a special man and a spectacular family of animals, Peggy’s book poignantly guides readers through her difficult journey toward healing and peace. Peggy’s website is www.peggymullinsauthor.com and her blog is http://everybodylovesikadogbook.blogspot.com.